Nothing ages as elegantly as an antique microscope. A bridge to an age when craftsmanship was as important as functionality, a vintage microscope is a work of art as well as science. In the late 16th century several Dutch lens makers designed devices that magnified objects, but in 1609 Galileo Galilei perfected the first device known as a microscope. His invention, a compound microscope, had a convex and a concave lens. Later that century, Anton van Leeuwenhoek refined the microscope for biological research. These first fledgling microscopes were generally built and used by a scientist. They can only be found in museums and are not available to the average antique microscope collector. Usually made of brass, the first microscopes were monocular instruments with simple lenses. Instruments manufactured in the 1800’s are the oldest an antique microscope collector can hope to acquire. For further history reading feel free to follow our link on the History of the Microscope. The German lens maker, Carl Zeiss, excelled at crafting precision lenses and began manufacturing microscopes in 1847. Initially building single lens instruments, in 1857 his firm began designing compound microscopes. Made of brass, many of these instruments had a black japanned base. His later microscopes used a draw-tube coarse focus and a knob controlled fine focus. He further refined the instrument with the incorporation of a rack and pinion coarse focus and fine focus enabled by a graduated wheel. Considered the finest optical instruments of the time, different magnifications were obtained by inserting eyepieces of varying lens strength into the monocular head in combination with different objectives. Immigrating to the United States from Germany in middle of the 19th century, Jacob Bausch and Henry Lomb began their association by manufacturing eyeglasses. Initially manufacturing single lens microscopes, they graduated to producing compound microscopes in 1874. They used different methods for focusing the instrument: a crew thread focus control on the nose end of the barrel, later discontinued in 1878, a draw tube similar to several other manufacturers and a rack and pinion system. Manufactured in 1876, the first professional model towering 17" tall was the Bausch & Lomb Model 76. Mainly constructed of brass, this model had nickel plating and hard rubber mounts for the eyepieces. A frictionless fine focus was achieved by using a micrometer screw located at the rear of the tube. Redesigned as a binocular microscope in 1883, it was one of the first commonly used binocular scopes. Originally selling for $200, this model is a fine collectible today. Bausch & Lomb and Carl Zeiss were preeminent figures in the field of microscopy, but other manufacturers also made instruments of great value and interest to collectors. Ernst Leitz of Germany and Parisian Camille Sebastien Nachet made quality microscopes that survive to this day; Watson & Son began operations in mid-1800’s England; Powell & Lealand, Beck, and Aransberg are other names associated with the collection of antique microscopes. A walking cane that could convert into a microscope or telescope, patented by James Pool in 1877. A dissecting microscope, requiring the specimen and microscope be held in one hand, was patented in 1891. A collapsible pocket microscope developed by Bausch & Lomb in 1865 – a precursor to a folding, portable dissecting microscope developed in 1880. An eye and ear microscope patented in1853 by H. Le Riemondie, which was a primitive ophthalmoscope or otoscope. The serious antique microscope collector inhabits a niche market that requires perseverance, knowledge and luck. Never eschew estate sales and flea markets, although auctions or private sales from other collectors will yield more assured results. Antique stores are a good hunting ground and even if the store doesn’t have one in inventory, talking to the proprietor may give you a lead. 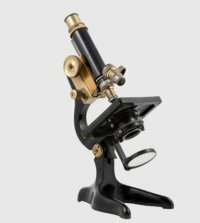 An antique microscope collector, whether he/she is an investor or hobbyist, must possess the knowledge to determine the authenticity of an intended purchase. Designs from the 17th century were very rudimentary, sometimes made from wood or leather; these designs gave way to brass in the 18th century and remained predominate until the 1930’s, when metal alloys became popular. Some early models were hand-held or rested on a stand or box. The development of the tripod-style base in the early 1700’s became the standard for the basic microscope design. Many microscopes were sold in wooden boxes with serial numbers on them and finding a vintage microscope with the box enhances the value. Proud of their craftsmanship, microscope makers routinely inscribed their name and model number on instruments –making identification of the exact make and model of an antique microscope is easier than most other antiques. Acquiring an atlas of antique instruments is still a good idea, with some publications available online. As with most collectibles, rarity, rather than mere age, determines value. A complete antique microscope set is worth more than one missing pieces. Old microscopes all came with several eyepieces of varying magnification; consequently if the microscope you are considering purchasing has only one eyepiece it may not be complete. Slides, casings and manuals also make a large difference in value. Popularly collected brands are Bausch & Lomb, Carl Zeiss, and Powell & Lealand – luminaries of the 1800s that combined aesthetics and precision. Bausch & Lomb were popular for their Stereo Zoom series and subsequently were acquired by Leica, Chinese copies/makes are manufactured in their place. Zeiss are still in business today as the oldest optical company and largest producer. Some vintage microscopes sell for a few hundred dollars, but most collectible models start in the thousand-dollar range. A Bausch & Lomb 1898 Model BB recently sold for just over $2,000 and other models sell as high as $10,000. Several Leitz microscopes from the 1920’s range from $500 to $800; however, eBay vendors have sold a few Leitz models from the late 19th century for less than $200. The beauty of an antique microscope is manifested in myriad ways. The shiny brass casing, the precision of 150 year-old gears, the solid metallic feel – all combine to instill a feeling of awe that a microscope can be so beautiful and functional after so many years. Leeuwenhoek Microscope - Designed around 1668 by a Dutchman, Antony van Leeuwenhoek, the microscope was a simple single lens device completely handmade including the screws and rivets with greater clarity and magnification than compound microscopes of its time. The Bausch and Lomb Compound Microscopes and the Bausch and Lomb StereoZoom Microscopes have lasting quality and are also worth investigating! To view images of a great collection, check out antique-microscopes.com. 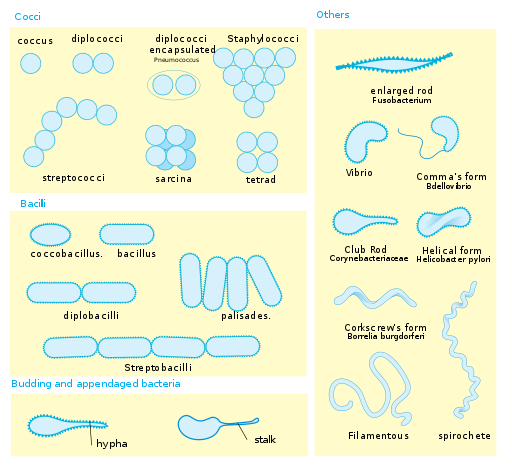 American Optical Microscopes and American Optical Stereo Microscopes.